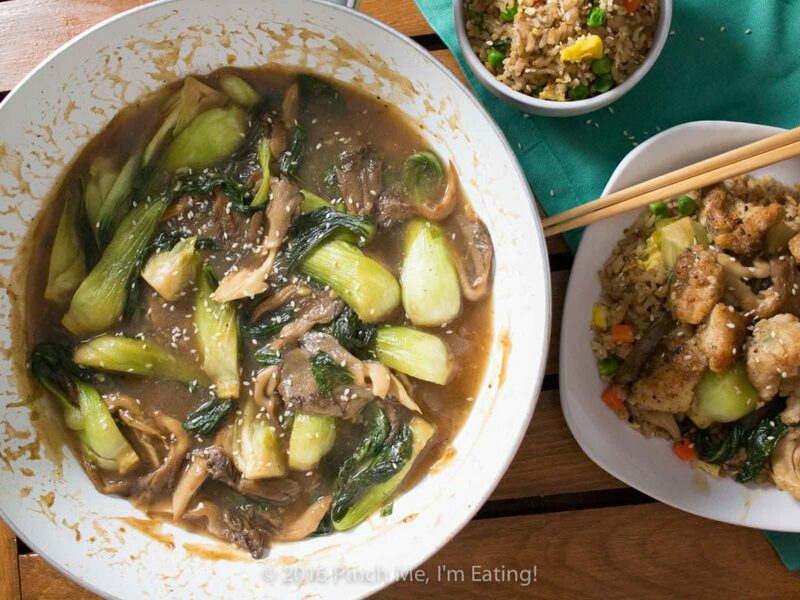 Chicken with Baby Bok Choy and Mushrooms | Pinch me, I'm eating! Am I the only one who thinks little vegetables are cute? 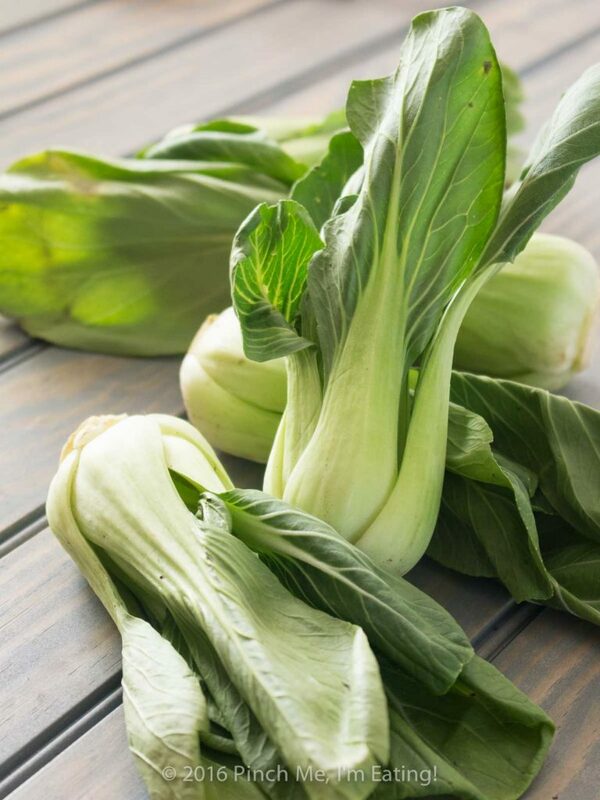 I’ve been coveting all the adorable baby bok choy recipes I’ve seen popping up in Pinterest, so when I saw some baby bok choy at the farmer’s market a couple weeks ago I couldn’t help myself! They were just so little and darling! 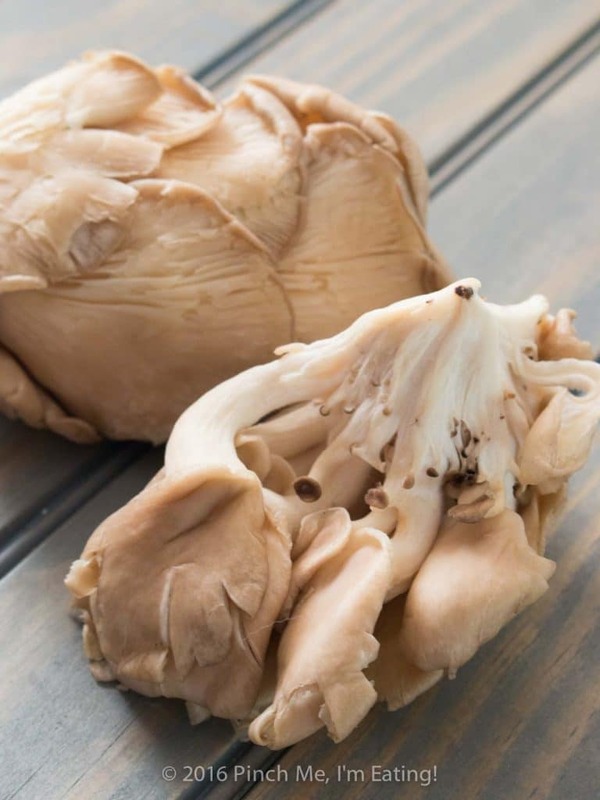 I got a few, plus a couple clusters of fresh oyster mushrooms, and envisioned cooking them with a thickened brothy ginger-garlic sauce, chicken, and cashews, served over rice. 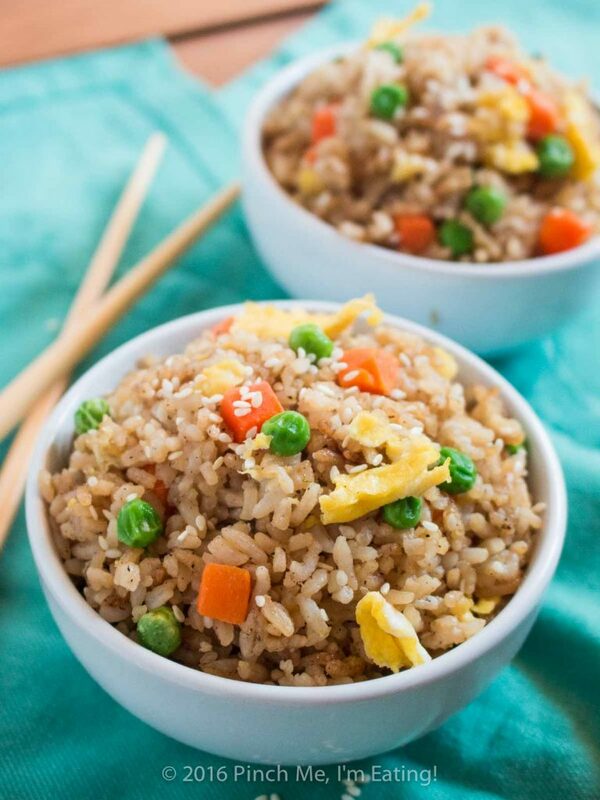 But why make regular rice when you can make fried rice? This vegetable fried rice was definitely in order. I made this flank steak, haricots vert, and potato salad, took a bunch of pictures, and only after I was satisfied with the photos did I realize I never added the blue cheese crumbles. I spent another hour shooting after adding it. One would think I would learn. But nope. My boss had gone to pick up a sandwich from Publix earlier that day and asked if anyone needed anything, anticipating potential lunch/sandwich requests. I had forgotten to get raw cashews on our weekly grocery trip and was planning on swinging by Publix after work, so I said, “Well actually… I have an odd request. Can you get me some raw cashews? They should be in the produce department, not with the rest of the nuts.” And she got me the cashews, bless her. And after all that, I put them away in the cabinet and FORGOT ABOUT THEM AGAIN! By the time Mike reminded me that I had intended to include the nuts, I had already cleaned up the photos setup, so you sadly don’t get any photos with cashews this time. I’m just going to call them optional. If you want, add them into the veggies and mushrooms in the last couple of minutes before you add the sauce. They’re delicious. So far this whole post has been about the Cashews That Could Have Been. But let me tell you about The Chicken That Was and Could Be (For You). It’s so good. I used a little trick I learned from Cooks Illustrated from their buffalo chicken about putting corn starch in with your breading flour to help your chicken get extra crispy, and another trick I learned (I don’t remember where) about taking the easy way out of egging and breading your bite-sized chicken by just mixing it all together in a bowl (first with egg, then with flour) instead of hand-dredging every piece, taking a hundred years, and having unnecessarily breaded fingers. Then you just dump the whole mess in some preheated oil and it’s almost like shallow-frying it but you only use enough oil for the chicken. It’s like the best parts of frying without all the oil cleanup and the house smelling like fried for three days. It’s pretty great for when you want fried breaded chicken really quickly and with very little cleanup. I keep it separate until it’s served – it tastes great with the sauce, but you don’t want it to get soggy. So, I bought the ingredients because of the cute little baby bok choys, but Mike mostly raved about how good the chicken was. I actually ran out of ginger while making this, so you might actually want to add a bit more than I did if you were hoping for a more noticeable ginger flavor. And throw some raw cashews in there. 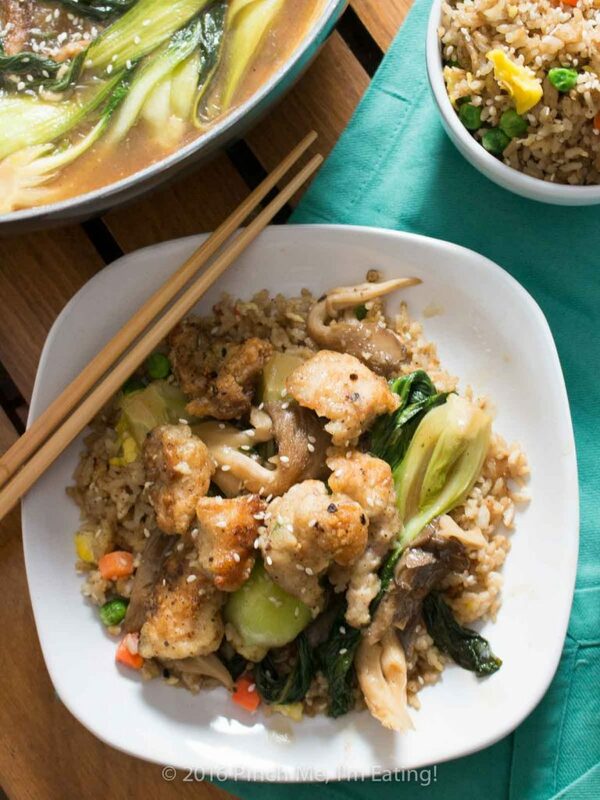 If you don’t have any baby bok choy, I bet this chicken and sauce would be great with some broccoli too, or napa cabbage, onions, and mushrooms. Maybe even throw in some bamboo shoots. So many possibilities! I’ll definitely be making this chicken and sauce again with other veggies too. Let me know if you have any suggestions for stir fry vegetable combos you think would be good with this! 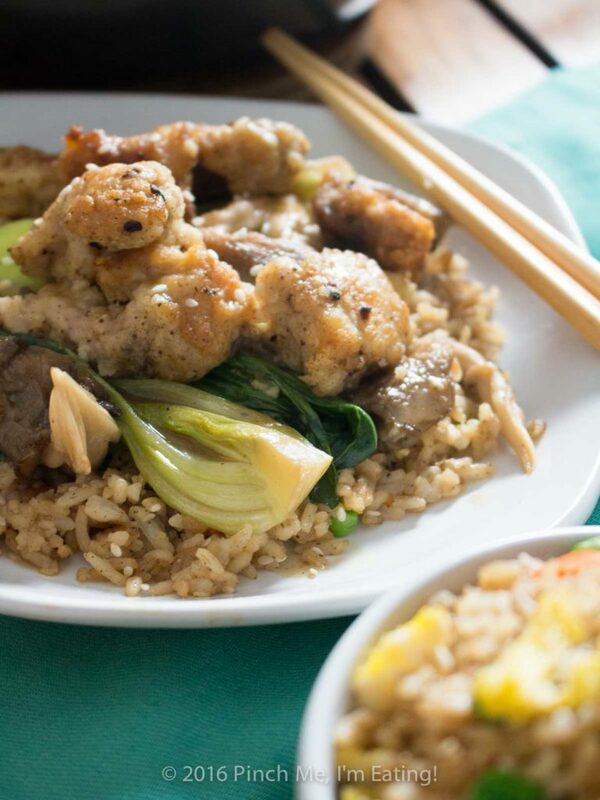 The quickest shallow-fried chicken bites served with adorable baby bok choy and oyster mushrooms in a brothy ginger-garlic sauce. So delicious! It's great with fried rice! In a medium bowl, mix chicken with beaten egg and mix to coat. Add flour, 1/4 corn starch, salt, pepper, and 1/2 tsp ginger and stir until chicken is evenly coated. 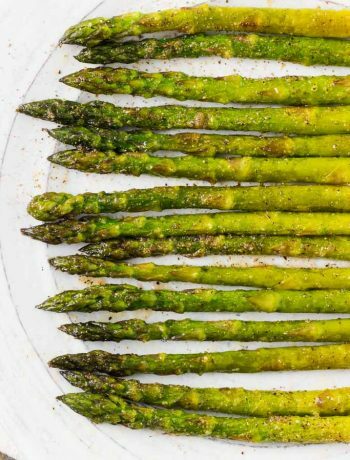 Preheat vegetable oil in a heavy bottomed pan or wok over medium to medium high heat. Add chicken and quickly spread out into a single layer. Let chicken cook for 2 minutes without stirring, then flip over and break apart pieces. Cook for an additional 5 minutes, stirring no more than once every 1 1/2 minutes or so. Remove chicken into a bowl lined with paper towels. Add 1 tbsp sesame oil to pan and heat. 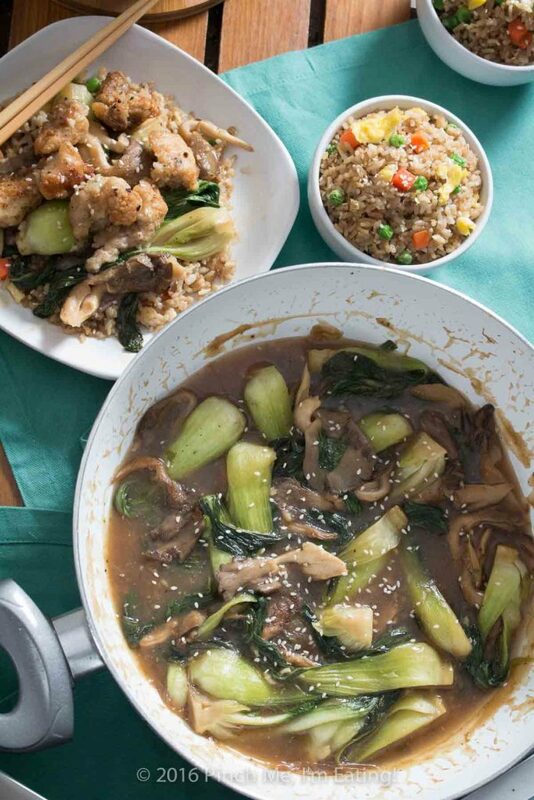 Add mushrooms to the pan and cook for one minute, then add bok choy. Cook for an additional 5 minutes. 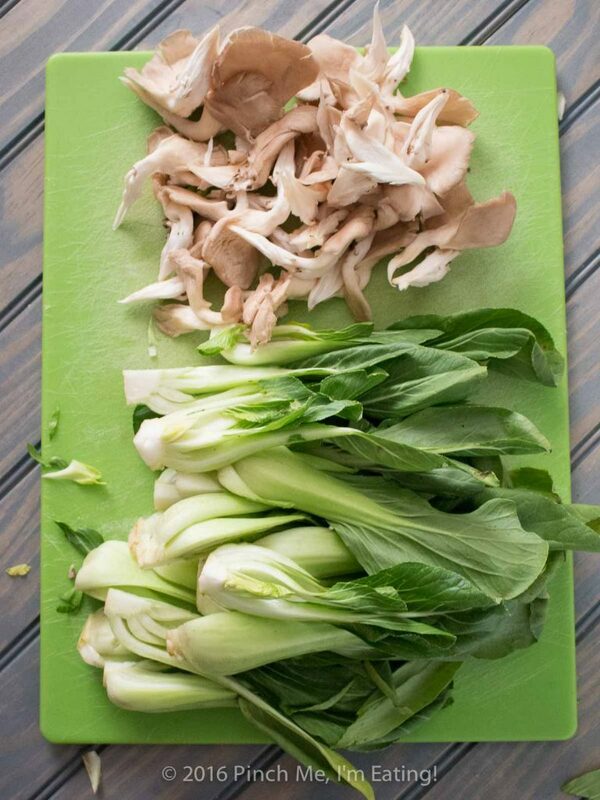 While mushrooms and bok choy are cooking, mix 2 tbsp corn starch with a little chicken broth until smooth. Mix with the rest of the chicken broth, soy sauce, 1/2 tsp ginger, garlic, and fish sauce. Add sauce to vegetables and heat through until thickened. 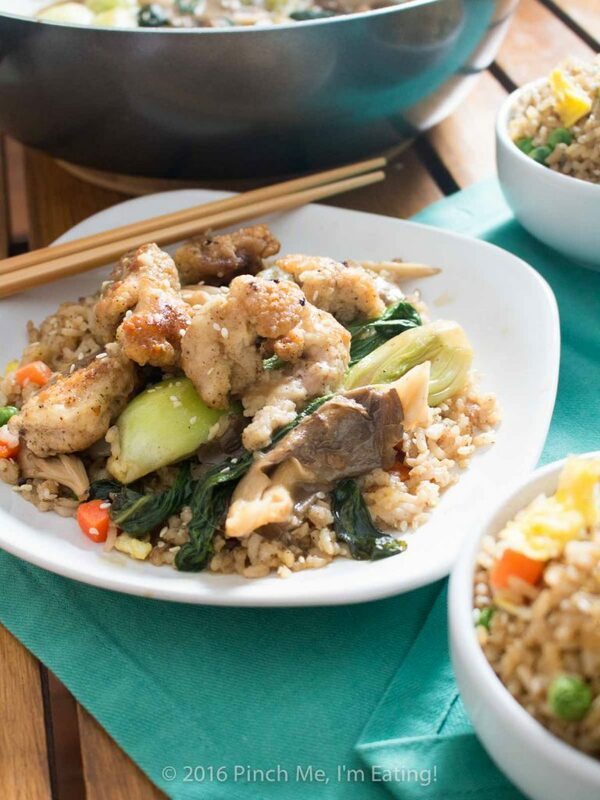 Serve with chicken over fried rice. 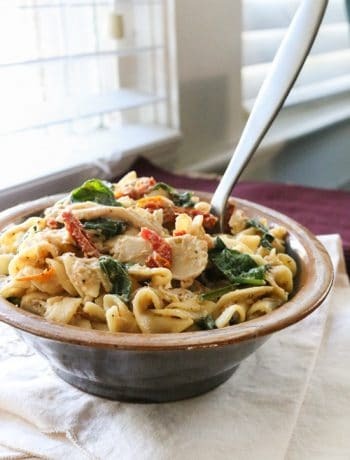 Keeping the chicken separate until serving rather than mixing it in with the veggies and sauce will help it stay crispy! This looks wonderful, Caroline, with or without the cashews! (I do that all the time, too…) I learned the cornstarch trick when I was in college – although mine was just cornstarch and no flour. It works beautifully and I seem to believe it also tenderizes the meat, too. Do you find that? It was so wonderful to meet you and Mike when you were in town. I really look forward to cooking together next time! Thanks, David! Glad to know I’m not the only one who forgets things in recipes! I’m not sure about the tenderizing – I usually use dark meat which is already pretty tender. 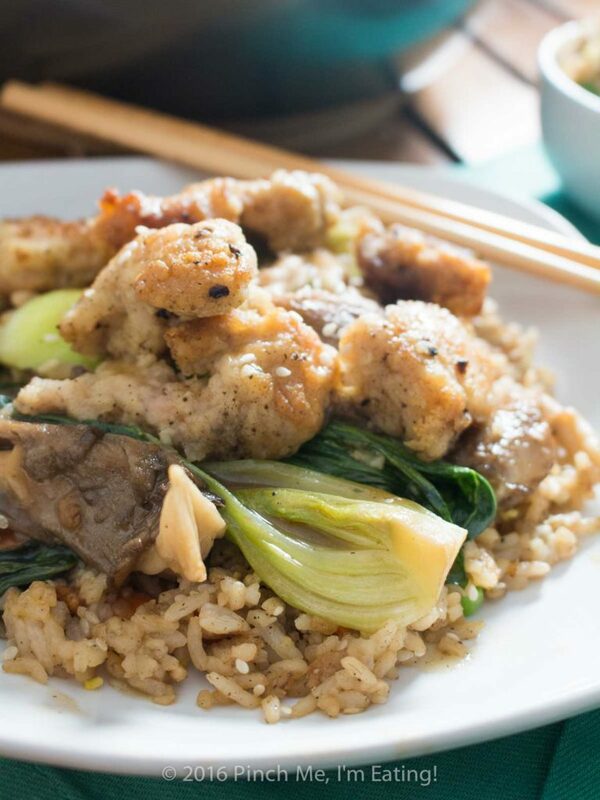 Do you find cornstarch helps keep white meat tender and juicy? I may have to try that! We had such a good time meeting you too and hanging out at Wilko! 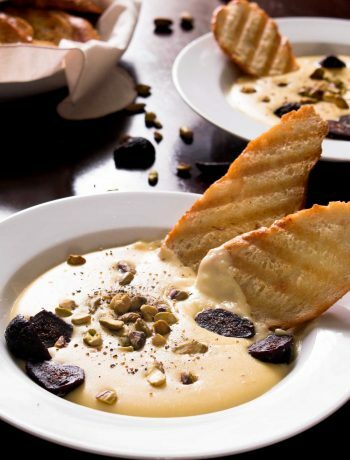 If you’re ever in our area we’d love to take you out to dinner or cook something with you! Charleston’s a lovely city to visit. I want to eat everything pictured here!! 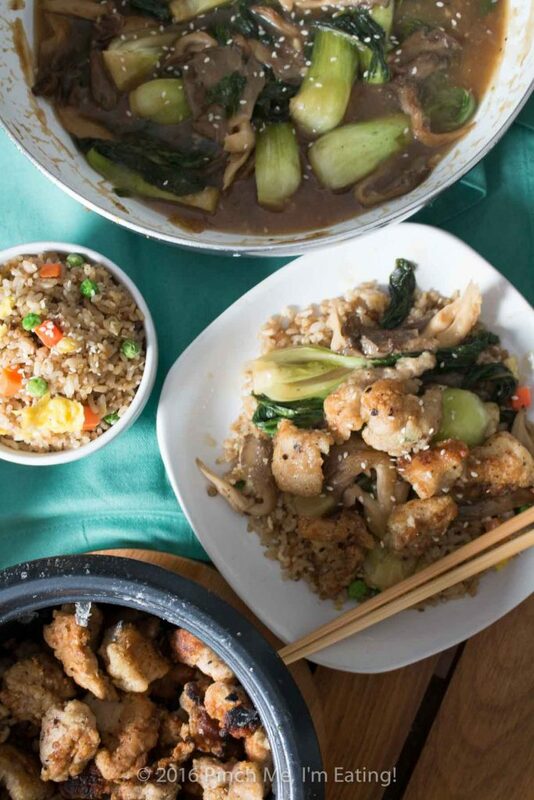 Asian food is one of my favorites. Thanks Amy! I don’t claim that this is authentic by any stretch, but it is definitely Asian-inspired. Looking forward to trying your Jewish recipes as well! Reminds me of my grandma’s house!